From a distance Bruges may look like a laid-back provincial city, but its culinary appeal shouldn't be underestimated. The Flemish Venice boasts one of the highest ratio of Michelin stars per capita in the world and rivals Brussels as the gourmet capital of Belgium. Taken together, Bruges and nearby Knokke-Heist, 17 km away, total up more Michelin stars (14 + 12) than any other European city apart from Paris and London. 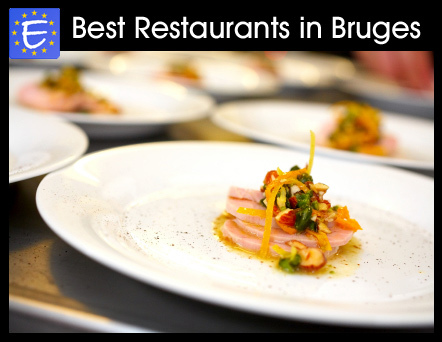 Bruges has two 3-stars restaurants, like London, and more than anywhere else in Europe besides Paris and San Sebastian. The total Gault-Millau ranking is also stupendous. Tiny Bruges ranks 11th among European cities for the total number of toques, and is only beaten in the number of 3-toques restaurants by Paris, Lyon and Berlin. The Michelin Red Guide is the international reference in terms of restaurant evaluation. The guide awards one to three stars to a small number of restaurants of outstanding quality. One star indicates a "very good cuisine in its category", a two-star ranking represents "excellent cuisine, worth a detour," and three stars are awarded to restaurants offering "exceptional cuisine, worth a special journey". The following restaurants have been awarded stars by Michelin Belgium & Luxembourg 2012. The Gault Millau Guide is the other influential French restaurant guide. It is known as Gayot in English-speaking countries. It rates restaurants on a scale from 1 to 20, awarding one toque to restaurants with a rating of 13 or 14, two toques for those scoring 15 or 16, three toques for 17 and 18, and four toques for the top score of 19/20. Five toques are awarded in some countries like France for restaurants scoring 19.5/20. The Gault Millau rating is shown in brackets after the Michelin star(s).